You want to test InLoox for your publication? Please contact us for a test license. Munich/Windhagen, February 28th 2012 – Non-profit organizations can now apply to receive four product variants of the Munich-based software company InLoox as IT donations on the IT donation portal Stifter-helfen.de – IT for Nonprofits. InLoox develops state-of-the-art business applications that are integrated in Microsoft Outlook and Microsoft Exchange Server®. The flagship product is the project management software InLoox PM. The software enables single users, teams and distributed work groups to plan milestones and budgets, organize documents, communicate progress and track efforts of their projects. InLoox donates four product variants to non-profit organizations (NPO). They can apply for up to 20 single user licenses of InLoox PM Personal. This product allows using InLoox PM for Microsoft Outlook on a single computer without a shared database for work groups. Non-profit organizations can also apply for one InLoox PM Workgroup Server License during the funding period. InLoox PM Workgroup Server is the prerequisite to use InLoox PM in work groups of up to 50 users with InLoox PM Outlook Machine Licenses or InLoox PM Outlook User Licenses. Eligible organizations can also make a request for up to 20 InLoox PM Outlook User Licenses. With this license type, a named user can access InLoox PM from different computers, but he or she only needs one license for that. During the funding period, up to 20 InLoox PM Outlook Machine Licenses can be applied for. A Machine License is recommendable if several project team members take turns on one computer with InLoox PM. In this case, they only need one Machine License. Eligible NPOs can make up to two applications for 21 licenses in total per calendar year. For the InLoox donation program, NPOs with a total budget of less than 5 million US dollars are eligible. The donation program is intended to help organizations being involved in the fight against poverty, immediate aid for the poor, the promotion of education, social welfare, culture, the preservation of monuments, protection of natural resources and the environment, sports or other purposes of public benefit in order to promote the common good. Political parties and foundations are excluded. “Non-profit projects can also benefit from a professional project management. We are happy to contribute to that with InLoox PM and we wish all users every success with their projects”, says InLoox Managing Director Dr. Andreas Tremel. 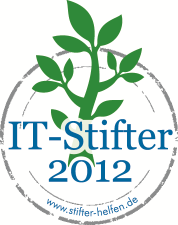 On the online platform Stifter-helfen.de – IT for Nonprofits, the 17 IT donators Adobe, Buhl, Cisco Systems, Citrix, Efficient Elements, ELO, Esri, Exclaimer, FundraisingBox , GiftWorks, Laplink, Microsoft, O&O Software, SAP, SurveyMonkey, Symantec and, now, InLoox, donate more than 280 state-of-the-art products. The non-profit organizations only pay a modest administrative fee and save between 90 and 96 percent of the current sales prices. More information on the criteria for eligibility is available on www.stifter-helfen.de. Non-profit organizations can also apply there for IT donations. Since the start of the online platform in October 2008, about 6,000 non-profit organizations have benefited from it. Through more than 200,000 product donations they were able to save more than 56 million euros. InLoox was founded in 1999 in Munich/Germany. The company develops state-of-the-art software solutions fully integrated into Microsoft Outlook, that streamline and accelerate business processes. The InLoox PM project management software is the company's flagship product. It is used in over 1,500 companies from all sectors of business, including more than 20% of the companies listed on the German Stock Exchange Index (DAX) and by more than 30,000 users on five continents and in over 40 countries worldwide. Well-known customers of InLoox include US Airways, AVIS, Charité Berlin, German Red Cross, Fraunhofer IWU, Hoffmann Group, Leonardo, Minol Messtechnik, Pentax Europe, Schenker Deutschland, SEAT, Siemens, SOS Kinderdörfer, Telecom Liechtenstein, and many more. The Stiftungszentrum.de Servicegesellschaft mbH with headquarters in Munich was founded in 1995 in order to offer professional services for non-profit foundations at favorable conditions. Currently, Stiftungszentrum.de counsels and administrates about 1,000 foundations with total assets of 140 million euros. The client foundations support different purposes – from child and youth welfare to hospice work or the protection of the environment. The associate partners of Stiftungszentrum.de are two non-profit foundations. The IT donation portal Stifter-helfen.de – IT for Nonprofits is run by Stiftungszentrum.de (www.stiftungszentrum.de) in partnership with the US-based NPO TechSoup Global (www.techsoupglobal.org). Project management software InLoox PM is now available as an IT donation on stifter-helfen.de - InLoox • Copyright 1999-2019 © InLoox, Inc. All rights reserved.